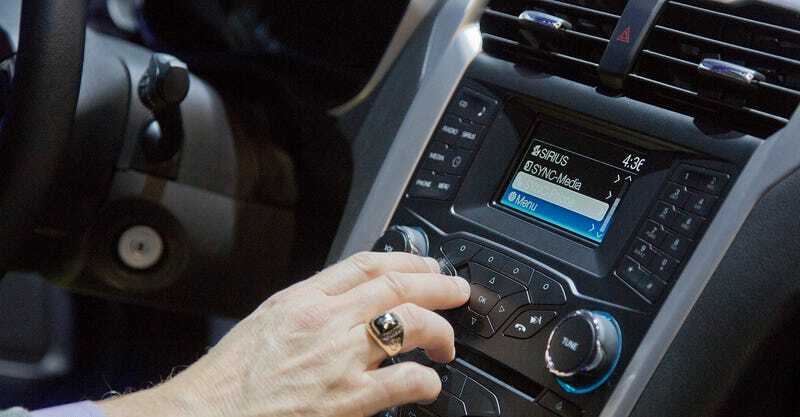 Why take 20 minutes to read through the available technology in your owner’s manual when you can just ignore the complicated infotainment system altogether and use your cell phone instead? That’s exactly what the 2015 Drive Report survey by J.D. Power found people doing, with 20 percent of participants having not attempted to use half of the technology in their cars, according to Reuters. More than 4,000 people were surveyed between April and June. The most underused feature was in-vehicle concierge systems that can recommend nearby restaurants or gas stations. It was not used by 43 percent of respondents and followed by mobile routers that turn a car into a Wifi hot spot, unused by 38 percent. Automatic parking systems were unused by 35 percent of those surveyed, the report found. Speaking from personal experience, I’ll be the first to admit that it is simply more convenient and comfortable for me to search for a destination on my phone before even getting to my car, rather than bothering to mess with the infotainment system. It simply seems more logical for me to know where I am going before I set off. Yes, features like “in-vehicle concierge systems” can be helpful - and safer to use while driving - when in dire need of a gas station or a potty break, but for the most part it is simply easier for drivers to use the features already available on their mobile device to get where they want to go, or even to just use the navigation signs on the side of the road. The survey found that safety features like blind-spot warning, collision prevention, and parking assistance were used more often by new car owners. However, safety systems are often an activate-and-forget button that the driver can switch on and never think twice about - that’s a lot different than actively engaging in a touch screen, or navigating a menu using voice recognition repetitively. I honestly don’t think this has anything to do with drivers being lazy, either. I think people, especially younger individuals, are just far more likely to use what they know instead of trying to adapt to buttons on a steering wheel or reaching to a touch screen to navigate unknown software they don’t use as frequently as their phones. The point of the survey, though, is that buyers are still paying for this unused technology. On a brand new Ford Focus, the 8 inch touchscreen navigation package is almost $800. Satellite radio capability, which my 2015 Focus came already bundled with, is $200. Paying for an extra thousand dollars in tech that you will ignore in favor of Pandora and Google Maps seems ridiculous, but those features usually come along with many other interior and exterior upgrades that buyers desire. A lot could also be said about the sad state of current infotainment systems on modern models, which are improving, but also remain extremely confusing and clunky, not to mention slow compared to the rapidly accelerating processing power of current cell phones. With Google Inc testing a self-driving car and Apple Inc reportedly working on its own version, the fact that 35 percent of new car owners never used their automatic parking systems may come as a surprise. Car companies have been struggling to keep up with the technology they offer in their cars. We are just now starting to see manufacturers yield to Android and Apple Inc by developing infotainment systems around drivers’ phones, and it seems that companies are finally starting to work technology into the driving experience in an intuitive manner. Only time will tell if people actually catch on. As far as the future of autonomous vehicles, if you can offer people more time on their precious phone during commuting, which they are already using instead of a car’s available systems, they will likely be very welcoming.